Harpy Eagles spend their lives in tall, remote tropical forests in Central and South America, flying from tree to tree in search of food. The eagles are named for the Harpies of Greek mythology, women with the bodies of birds who, on Zeus’s command, snatched people from the earth. Since it takes many months for a nestling to mature, Harpy Eagles raise a youngster just once every two or three years. 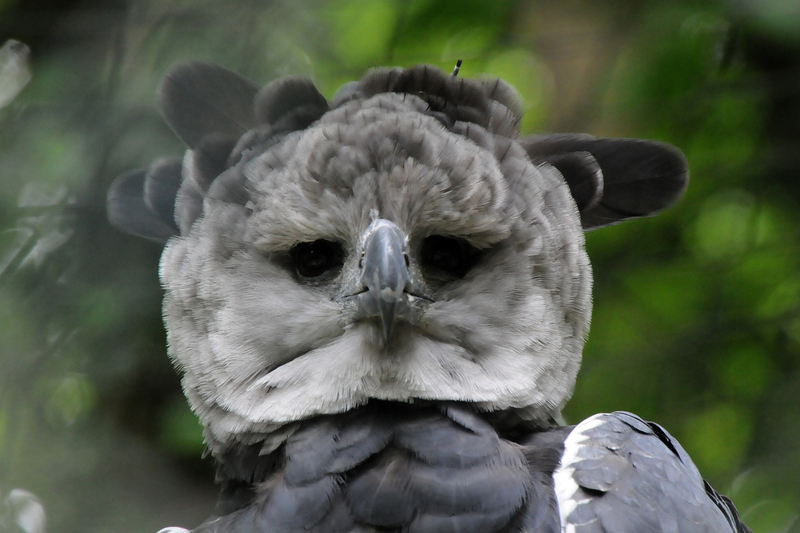 If there is a single bird that captures the imagination of birders it may be the Harpy Eagle. Harpy Eagles are huge, powerful hunters that spend their lives in tall, remote tropical forests in Central and South America. Named for the Harpies of Greek mythology, gruesome women with the bodies of birds, these eagles fly from tree to tree in search of food, rarely venturing into the open sky above. Feathered in varying shades of gray with a white belly, the Harpy has a strong hooked beak, and distinctive tall feathers that stand out straight from its head. Harpy Eagles are massive. Females, larger than males, are three and a half feet long and weigh up to 20 pounds. That’s heavier than the largest Bald Eagle. Their rear talons measure a full five inches, ideal for plucking sloths and monkeys from the trees. Harpy Eagles may not be the Hounds of Zeus, but they are legendary in their own right. However, human persecution and ongoing cutting of forest are threatening these eagles, who raise just one nestling every two or three years. So each one is precious — and spectacular. Bird sounds provided by Xeno-canto. Recorded by David Edwards and Dušan M. Brinkhuizen. What do Harpy Eagles look like? Harpy and Crested eagle caught on camera in the canopy of the Amazon Rainforest!